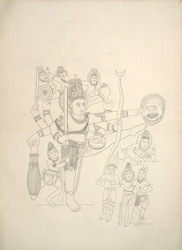 Pen-and-ink drawing of a sculpture of Vishnu Trivikrama from Badami, by an Indian draftsman, dated 1853. This drawing depicts the large high-relief sculpure situated at the end of the porch of Cave 3 at Badami, which was excavated during the reign of the Early Chalukya ruler Pulakeshin I in 578. It represents Vishnu as Trivikrama, who in three steps encompassed the earth, the atmosphere and the sky and gained rulership of the universe. The myth tells that Vishnu assumed the form of the dwarf Vamana and extracted a promise from the demon king Bali and asked that he could have as much land he could cover in three steps. When Bali agreed, Vamana transformed himself into the giant Trivikrama and covered the earth with one stride, the mid-world between the earth and heaven with a second stride and with his third he stepped onto Bali and sent him to the underworld. In this way Vishnu reestablished himself as the master of the universe. Badami, formerly known as Vatapi, was the capital of the Early Chalukya rulers in the sixth - eighth centuries. The town is situated between two rocky hills of red sandstone that surround an artificial lake. There are two later forts that overlook the town. Around the south fort there are four rock-cut shrines while structural temples dominate the site on the opposite north fort. Cave 3 is the finest of the series.